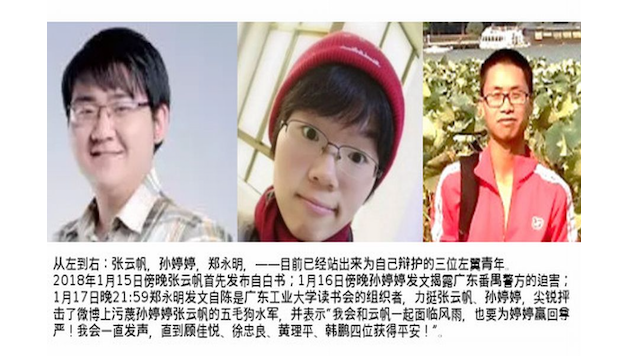 On 15 November, two youths taking part in a leftist reading circle at Guangdong University of Technology in Guangzhou, were arrested by police on the ridiculous pretext of “illegal business operations”. This was later changed to “gathering crowds to disturb social order”, a very common charge against worker activists and others. Half a month later, two organisers of the reading group were detained on the same charge. Four other participants are still wanted by the police. At least seven of the eight youth are Maoists. The police raid seems to have resulted from the fact that during the meeting of the reading circle, participants discussed the 1989 democratic movement in China (which ended in the massacre of 4 June), and also criticised the widespread censorship operated today by the ruling CCP (so-called Communist Party). These are taboo topics in China. The police action in Guangzhou is therefore not surprising, given the wider crackdown in China under Xi Jinping, the most ferocious phase of repression since 1989. But the Guangzhou case can have more complicated implications. Xi has paid some superficial tributes to Mao Zedong, partly in an attempt to utilise Mao’s prestige among sections of the masses in order to consolidate his and the CCP’s rule. Not long after coming to power, Xi announced to a meeting of senior officials: “The history of the first 30 years (the Mao era) of the PRC must not be denied”. Such statements led some people to believe that China under Xi was ‘turning left’. When targeting liberal bourgeois opponents, the regime claims these individuals collude with western “anti-China forces” to “subvert the socialist system”. Such, mostly fictitious, accusations can extract support from some nationalists. But when accusing young people who support Mao Zedong of being “anti-CCP” this increases the political contradictions for the regime. It risks alienating the Maoist layer, who make up probably the largest part of left-leaning youth in China. They, while objecting to the restoration of capitalism in China, tend to give support to the regime on many issues (especially in rejecting ‘democracy’) because of a fundamentally nationalist approach. Another and deeper reason for the police action is that the upturn in workers’ struggles is frightening the CCP dictatorship, especially when it has not eliminated the dark clouds of economic crisis. Three staff members from a well-known labour NGO in Guangdong were sentenced to harsh prison terms in 2016. So the growing number of young leftists, representing the radicalisation of the Chinese masses, and their attempts to propagandise ‘Marxism’ (although with lots of elements of Maoism), seems very dangerous to the CCP whose rule is based on “capitalism with Chinese characteristics”. In 2014, students from some universities in the same district where the ‘15 November’ incident happened, offered help to a strike by 200 cleaners. Following the crackdown on the Guangzhou reading group, hundreds of people including left supporters and liberals, signed a petition against the flagrant suppression of democratic rights and the developing workers’ struggles. This has encouraged other sections of left-leaning youth, who have undergone similar repression, to speak out, reporting their own experiences of repression by the authorities which was formerly unknown to the public. This wave of protest, with online petitions signed by hundreds, including some well-known scholars, has forced the police to suddenly stop the detentions and release the four on bail. However, they are still under surveillance and face police harassment, while four other fellow reading group members are still being hunted. At the same time, many left circles that have shown solidarity are being silenced and very possibly will face similar attacks in the near future. The CWI and socialists internationally condemn the CCP regime’s brutal repression. We stand for full and genuine democratic rights for the masses in China and internationally. The struggle for real democracy is inseparably linked to the struggle for international socialism led by the working class. Dictatorial rule like that in China today is a tool to protect the capitalists’ profits: independent trade unions are banned, striking workers arrested and criminalised, migrant workers are super-exploited and also evicted from the big cities as part of ‘social cleansing’ for the purpose of gentrification, etc. Only a socialist society, democratically run by working people, can guarantee freedom of speech and all democratic rights. This protest letter/email can be sent to the Chinese embassy in your country.